This field of this antique Oushak carpet from Turkey has a grand, four-petalled medallion and corner pieces. 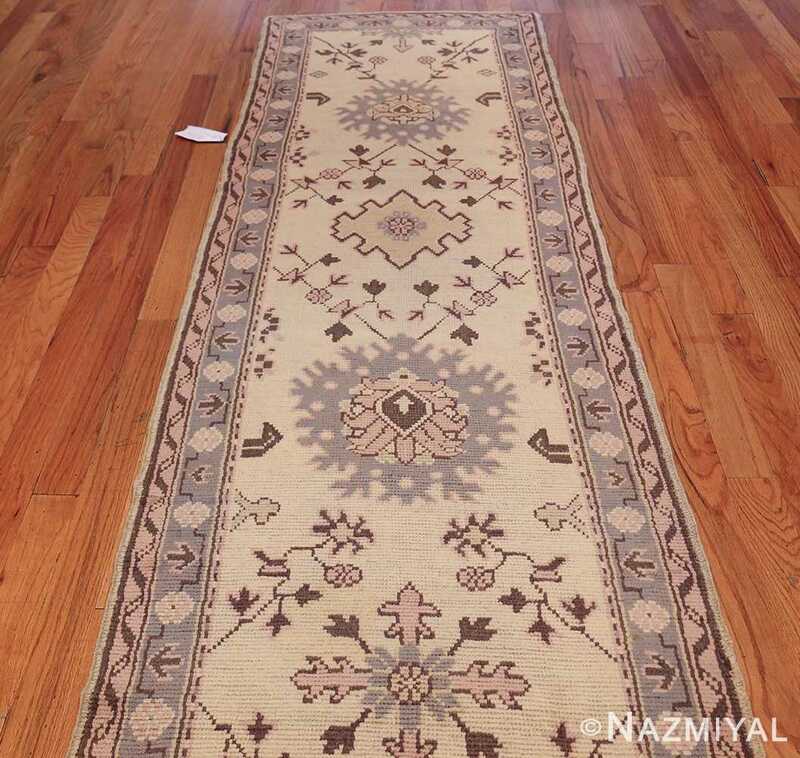 Antique Turkish Oushak Runner Rug, Country of Origin: Turkey, Circa Date: 1900 – With a singular, yet subtle mix of geometric pattern and floral, this runner carpet’s border has a repeating floral medallion design intermingled with arrows, angles and striking lines that give the pattern a three dimensional appeal. 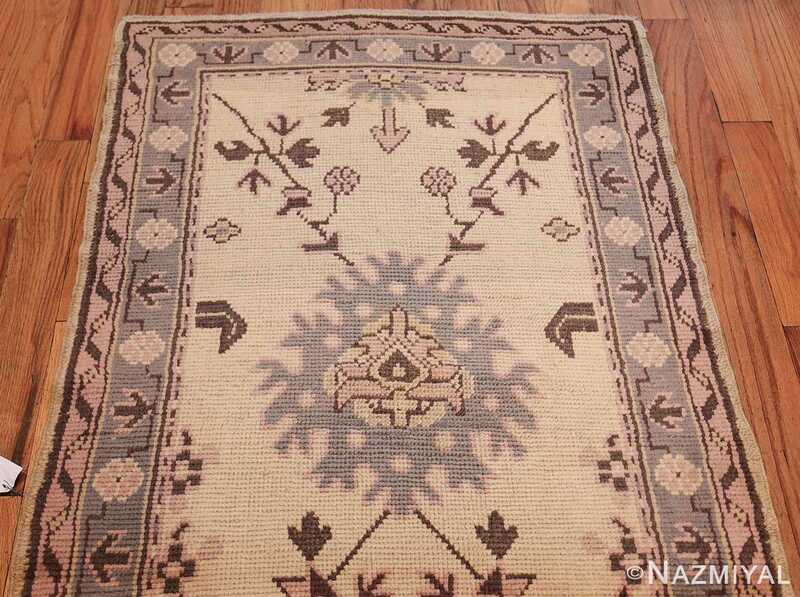 This antique Turkish Oushak rug pattern is consistent around the border, even into the corners. The soft flowers in the edging contrast with and are emphasized by the almost mathematical lines and corners. In a marvel of symmetry this contrasting theme of gentling flowing shapes juxtaposed against sharper lines is carried through the entire antique Turkish rug. 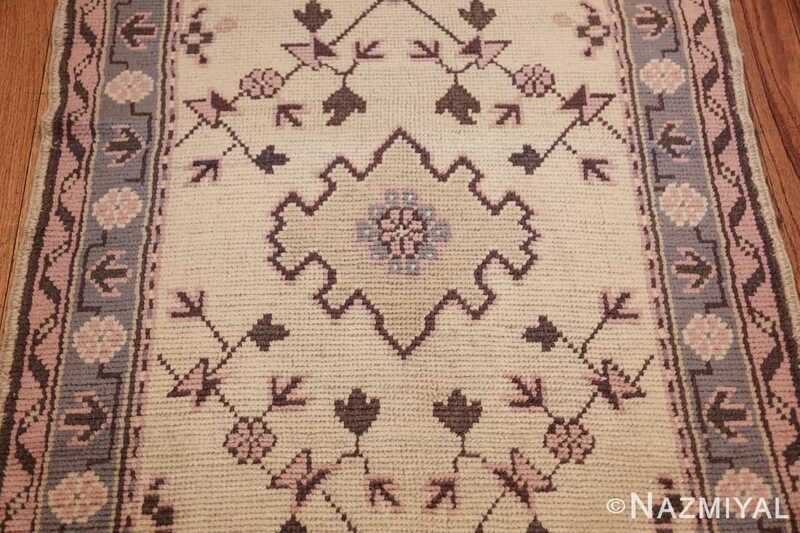 The flower medallion is repeated in the corners of the main portion of the Oushak rug, just inside the border; but leaves and greenery add a new facet to the design. 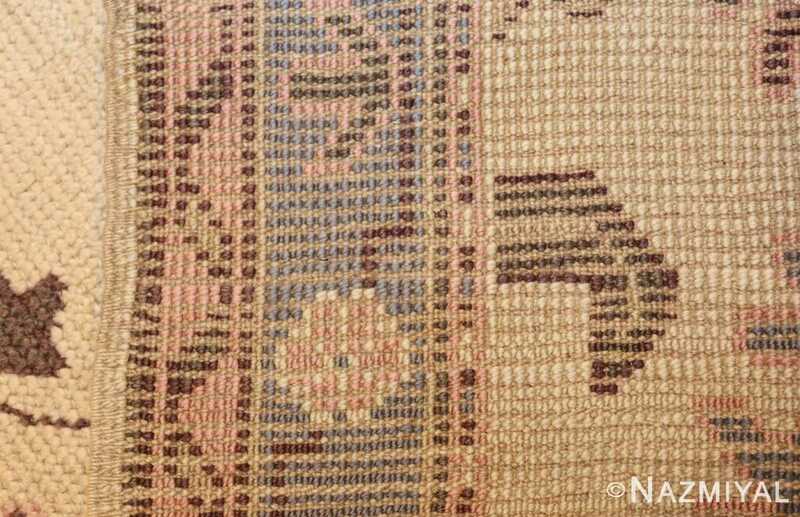 At first, the floral and leaf pattern in the central area of the antique Turkish Oushak runner rug is more open and un-embellished. 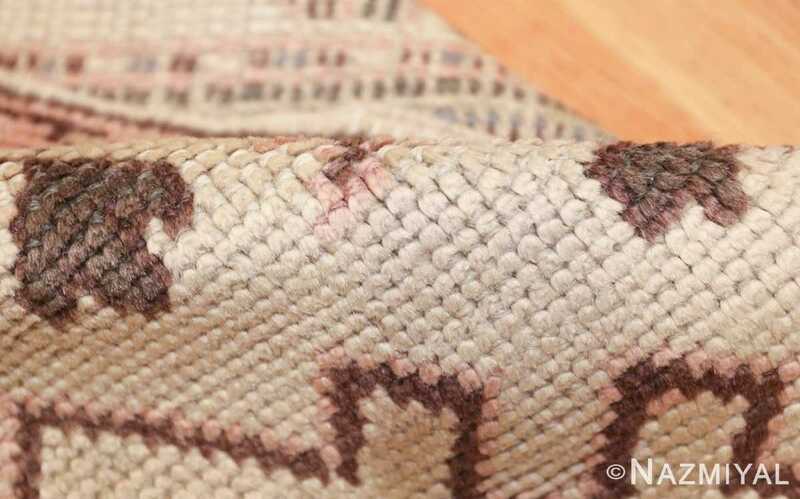 As the eye is drawn towards the center of the antique Oriental rug, more intricate patterns start to emerge. 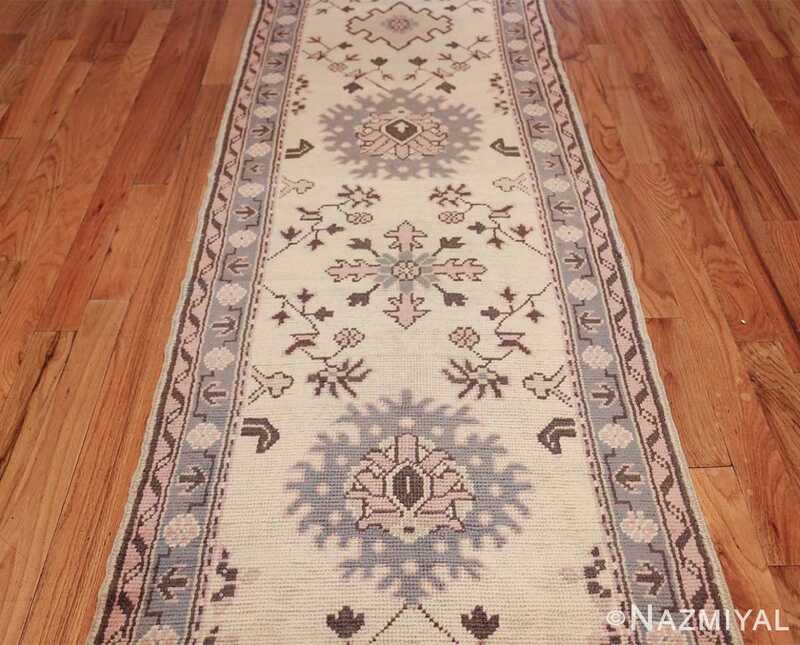 They surround flowers closer to the middle of the Oushak runner and this design alternates with larger designs that have parallels to the floral medallions on the perimeter. Drawing the eye as the focal point, there is a unique center four corner design that is graced with further floral designs, three on each side of it. Two of the three designs to the side are more involved and have softer, more flowing lines. 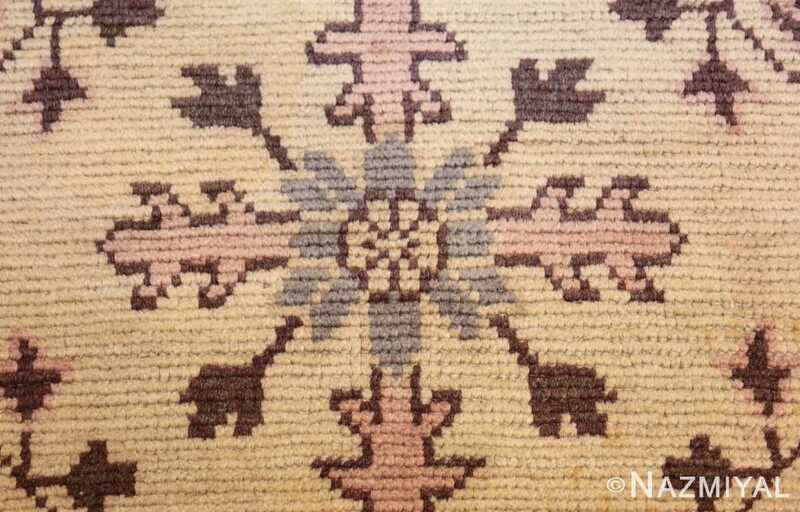 These two designs frame another pattern that surrounds a smaller flower medallion with lines and right angles. The detailed weaving of the decorative carpet’s soft and subtle colors celebrates a period of understated luxury in carpets that has survived the test of time with grace and dignity. 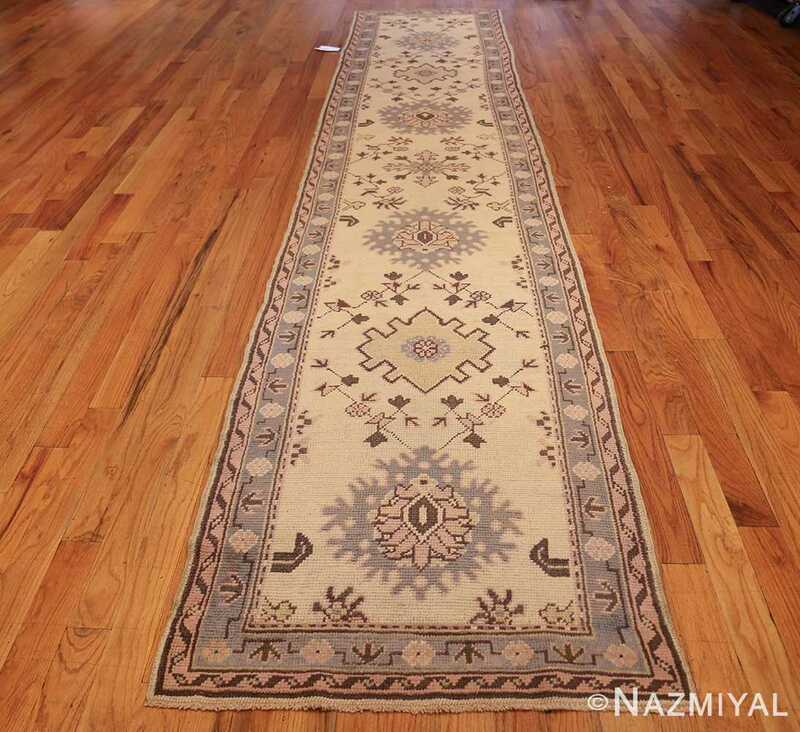 This charming antique Oushak has a design derived from classical Northwest Persian garden carpets.